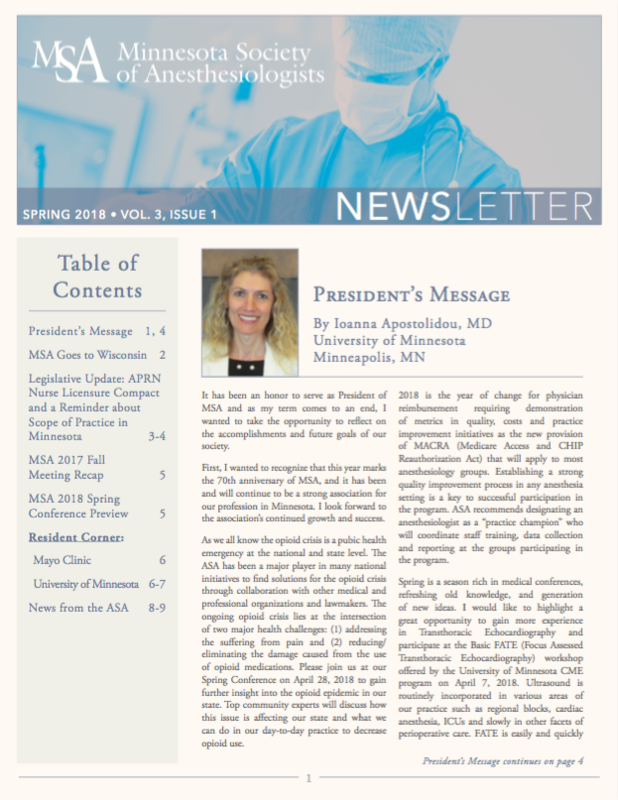 The Minnesota Society of Anesthesiologists (MSA) is a physician organization committed to patient safety, educational advancement, and best possible anesthesia care. As a statewide organization of anesthesiologists, it serves patients, the public, lawmakers, physicians and other professionals by defining and advancing the standard of anesthesia care and supporting the practice of anesthesiology in the state of Minnesota. Take Action - Contact the Minnesota Department of Health! Members of the MSA enjoy many benefits, including professional and leadership development, continuing education, advocacy at state and national levels, patient information, resident engagement, and more. CLICK HERE to download the most recent MSA newsletter.